This two-day in-person workshop brings together a cohort of skilled practitioners for the purpose of deepening the repertoire of team interventions to put the 6 Conditions in place for any kind of team. Built around hands on practice, the Advanced Practitioner Certification course puts participants in the role of team coach or consultant in real time, to sharpen approaches to processing Team Diagnostic Survey feedback with leaders and teams, and developing timing, sequencing, and interdependence of team interventions. Enrolling in the Advanced Practitioner Certification includes access to the online Foundational Practitioner Certification. 6 Video-Based Learning Modules (50+ videos)! TDS Account for Administering Surveys*! Prework – Prior to the two-day workshop, you will have access to online video-based training modules to begin your learning about the TDS framework. The self-directed study modules are designed to prepare your to fully maximize your two-day course experience. The modules also serve as a resource center for supporting your ongoing learning and application of the TDS following the program. 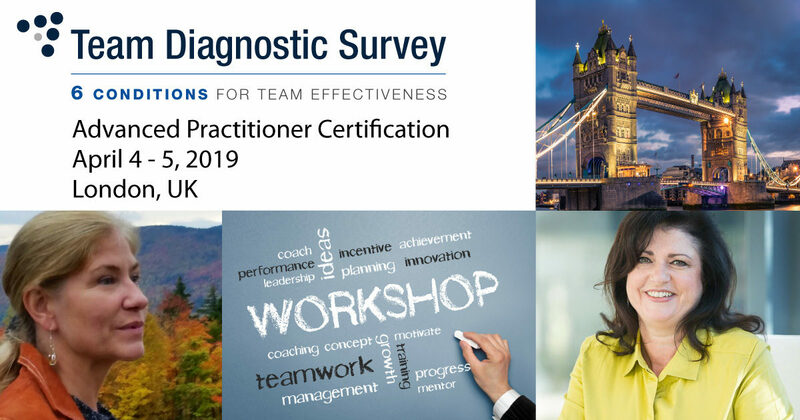 Day One – On the first day of the workshop, Ruth Wageman and Georgina Woudstra, Master Certified Coach will introduce you to the origins of the TDS framework and survey. Through interactive exercises and case examples you will internalize 6 conditions, 3 key task process and 3 team effectiveness outcomes that comprise the model. You will also examine case examples of the TDS interventions based on real-world teams. Day Two – On the second day of the workshop, you will get hands on practice diagnosing and coaching teams using the TDS through simulation. You will learn specific techniques for feeding back survey data to team leaders and teams; you will explore teambuilding designs and activities for launching and re-launching teams; you will understand key principles and practices for coaching teams using the TDS on an ongoing basis. You will also learn about the latest trends in teaming and how the TDS supports your continued success as a team consultant, coach and/or facilitator.